Stamporama: Did You Know .... about how to View Your Open Auctions? Did You Know .... about how to View Your Open Auctions? For a long while I had been frustrated with the Stamporama Auction from the point of view that once I placed a bid on an auction, I could not see the details of the bid that I had made. If the minimum bid on the auction was say $2.00 and I really wanted the stamps, I might have placed a bid on the auction up to $5.00. The bid program would make me the high bidder at $2.10, which I could see, but I could not see how much my top bid was. I don't know about you, but I forget these things. If I place half a dozen bids on different lots, the next day when I come back to look how they are going, there is no way that I can remember the bid amounts that I placed on the auctions. So that is why I wrote the "View Your Open Auctions" program, which is accessable from the Auction home page. On the Auction home page, select "View Your Open Auctions (Buyers)" as shown above. If you haven't recently logged in to one of the new Auction programs, you will be asked to log in using your Auction Username and Password. The following screen will be displayed. In the above screen you can see all the auction lots that you have placed a bid on, grouped by category. In the above example I have placed bids on lots from the British Commonwealth category and the Covers category. It is always important to know who the seller is, so the usernames in the Seller column provide a link to the seller's information in the members database. The one thing that I don't like about this screen is that there is no way at the moment to sort the auction lots by Closing Date, so within category the lots appear in a kind of random closing date order. Next we have the current high bidder and the current high bid. If you want to know more information about the person who is bidding against you, the High Bidder column provides a link to the information in the members database. 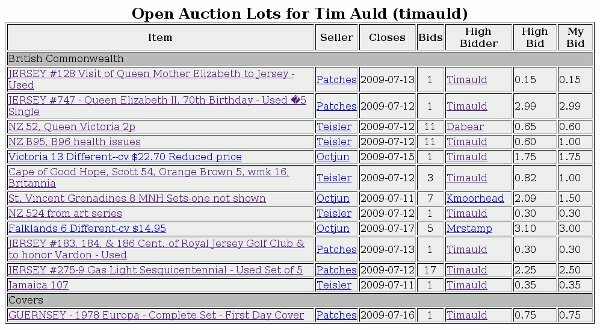 The last column provides the information that is most important to me, and that is what I have bid on the auction lot. I find it very handy to be able to compare the amount that I bid on the lot with the actual current high bid. The information on this screen is taken from the actual auction files so it is current as of the moment that you run the program. I hope that you find this program as useful as I do.